1. All rules must be followed or the deposit will not be sent back or using the Community Center in the future will be denied. 2. Absolutely no alcohol of any kind allowed in the building. 3. All doors and windows in the building must be checked and locked. The Sumner Community Center. Click for a larger picture. 6. Bathroom's picked up and toilets flushed. Both bathroom doors must be left open. 7. Kitchen counters, sink, stove, refrigerator, tables, and chairs must be wiped off. 8. All trash in kitchen, gym, hallway, and bathrooms must be taken care of and new lawn and leaf size trash bags (provided by the renter) put in the containers. 9. No one is allowed to climb or set on the shelves in the hallway. Children playing in the hallway must be watched by and adult and all times. 10. All damages are the responsibility of the renter and as such, a bill will be sent for the amount of damages. 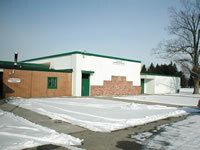 If you would like to rent the community center, please call Carlene McGill at (989)463-4531.